It’s Soccer World Cup Time!!! And we’re having a great sale for you at the Studio: This sale runs all 32 days of the World Cup, but: it changes daily. Bottomline: If the Designers team is playing, their store is on sale for 50% OFF. You can click on our handy World Cup Banner in the store, for game times & teams. My team is Germany so my store is on 50 % off sale, today, on Friday and Wednesday the 23rd. Hopefully for more days after that if the Germans play well. AND if they reach the finals, my store will be 75 % off!!!! Like it? 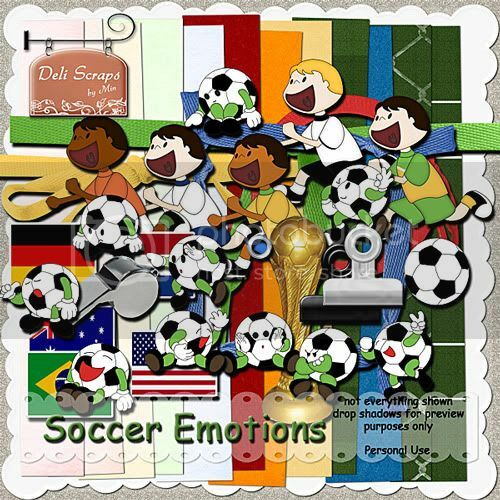 You can get it for free – righ now, it’s “Free with Purchase” at the Studio: Place goodies for 5 $ or more in your shopping cart and you can add Soccer Emotions free!! Have fun supporting your team and happy scrapping!